Rugby is a fast paced, team-oriented, contact sport that originated in England in the 19th Century. There are two formats: 15 a side (15's) and 7 a side (7's). In the 15's format, games are played in two, 40-minute halves. We play 15's in the fall and spring. In 7's, each half is 7 minutes long. We play 7's in the summer. For The Sabres, you have to be at least 18 years of age. What are the rules, and where can I find out more? Absolutely not! We will teach you everything you need to know! Is there a certain date I need to join the team by? No. Any time is a good time. Even if you start in the middle of the season you will be just as involved. Wear work-out clothes that can get dirty, stained, and/or ruined. Wearing layers is a good idea during colder practices. Bring water, cleats, a molded mouth guard, and a good attitude. What would I need to bring for a game? Wear scrum shorts, knee high navy socks, and a warm up t-shirt. These items can be purchased from the team. A team jersey will be provided for you during the game. Bring water, cleats, and a molded mouth guard. Where and how long are games and practice? 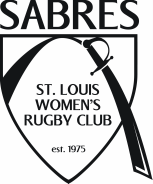 We usually practice on Tuesdays and Thursdays from 6:15-8 p.m. Our practices are at one of our many St. Louis parks (usually in the city) with locations determined once the season starts. ​Our games are played on Saturdays, and are usually late-morning. Locations are unknown until closer to the season, we also play away games. Will I spend a lot of time "watching" my teammates during games? Will I get cut? Our coaches put a lot of time and thought developing the roster. Rosters are determined by a player's ability to play safely. The more practices you attend, the better you get, and the more playing time you get! We welcome all types of players to the Sabres and do not "cut" players. If you come to practice, you will get playing time. Team dues re $50 each season (spring and fall). You will have to register (CIPP) with USA rugby before you play, and the cost for that is about $100. This fee is paid once a year. You will eventually need a pair of Sabres Rugby shorts (for our League Matches) which cost $27, but this isn’t a requirement to be allowed to come to practices and some games. If you are unable to pay all or a portion of the finances, don't let this discourage you! Please speak with one of our exec members for options on how to still play. Your dues will go towards the team. This helps to pay for our team expenses. We travel a lot for away games, and this helps to pay for the hotel rooms we sleep in. You have to CIPP with USA Rugby, because that’s kind of like Rugby insurance. It just simply covers you from being liable for any injuries to a third party. What if I work or have class during practice? If you know that you will be unable to attend a practice or game, then communicate your conflict with coach. We understand that work and/or class is important and a priority. Injuries in rugby are no different than injuries from other sports. While no sport is guaranteed free from injuries, rugby is comparatively safe. Bruises, bumps, and scrapes are common among rugby players, but our coaches work hard to create a safe environment and playing conditions for all players by teaching you how to tackle and fall safely. Please visit the Support Us page on this website. Please visit the Contact Us page on this website. You may also contact us through the social media links listed on the Support Us page.